Jim Edmonds rates among an elite class of outfielders who fielded with consistent excellence and hit with astonishing power. That combination wasn’t enough to earn Edmonds election to the National Baseball Hall of Fame when he became eligible. When voting by the Baseball Writers Association of America was announced on Jan. 6, 2016, Edmonds got just 2.5 percent of the vote. Edmonds, who played center field for the Cardinals from 2000-2007, won eight Gold Glove awards and had a career slugging percentage of .527 in 17 big-league seasons. Only two Hall of Fame outfielders, Willie Mays and Ken Griffey Jr., have both more Gold Gloves and a higher career slugging percentage than Edmonds. Mays has 12 Gold Gloves and a .557 career slugging percentage. Griffey won 10 Gold Gloves and had a .538 career slugging percentage (only 11 points better than Edmonds). The only other Hall of Fame outfielders with more Gold Gloves than Edmonds are Roberto Clemente (12) and Al Kaline (10), but both have lower career slugging percentages than Edmonds. Kaline had a .480 slugging percentage and Clemente was at .475. Slugging percentage defines a batter who hits for power. It is calculated as total bases divided by at-bats. Edmonds had 3,615 total bases in 6,858 at-bats. His slugging percentage in eight seasons with the Cardinals was .555, almost 30 points higher than his career percentage. Edmonds had 2,012 total bases in 3,628 at-bats with the Cardinals. Many Hall of Famers with reputations as power hitters have career slugging percentages lower than Edmonds’ career mark of .527. Among the most prominent: Willie McCovey (.515), Eddie Mathews (.509), Harmon Killebrew (.509), Joe Medwick (.505), Jim Rice (.502), Ernie Banks (.500), Orlando Cepeda (.499), Reggie Jackson (.490), Andre Dawson (.482), Eddie Murray (.476), Johnny Bench (.476) and Dave Winfield (.475). Edmonds has the same career slugging percentage as Hall of Famer Mike Schmidt. Of his eight Gold Gloves, Edmonds won six in a row with the Cardinals from 2000-2005. The Gold Glove Award first was presented in 1957, so many Hall of Fame outfielders never had a chance to earn one. Still, Edmonds’ total is outstanding and a testament to his talent. Edmonds’ Hall of Fame candidacy likely was hampered by falling short of 2,000 hits. He had 1,949 career hits, with 437 doubles, 393 home runs and 1,199 RBI. 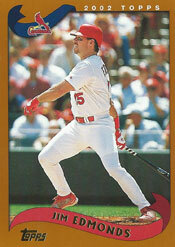 Jim Edmonds was hands down the best Cardinal center fielder I have ever seen. Both defensively and offensively. Better than McGee or Flood. I am convinced he was the best of his generation in all of baseball. Some people, who didn’t see him on a everyday basis, seem to think he was a hot dog. That is ridiculous. He was as steady as they come. He just made an amazing amount of highlight catches. He dove when necessary, never for show, which is so prevalent today. He was damn near as good defensively as the great Ozzie Smith. Throw in his prolific power hitting, and you have a 5 tool, dream center fielder. I truly hope he gets his just desserts, in the HOF voting. He truly was, one of the all time great, center fielders. Thank you for your insights. I hope the Hall of Fame voters are as astute as you. Let’s get it right. Clemente’s career slugging percentage was nowhere near “more than 100 points lower than Edmonds’ total”. At .475 Clemente’s slugged a career average just .005 less than Al Kaline. Thank you for pointing out the error. I have updated with the correct number for Roberto Clemente.